When I checked my Sierra Leone videos and slide shows on YouTube this week, I was amazed to see the one on devil dancing in Rotifunk had passed 4000 views in ten months. That in itself is not so remarkable. What surprised me more was viewers had come from 100 countries. This video I put up just to entertain friends and family hit 4224 views this week from 100 countries. What makes people drawn to devil dancing? It makes sense that half the views come from the U.S., followed by U. K., Canada, Netherlands and Australia. 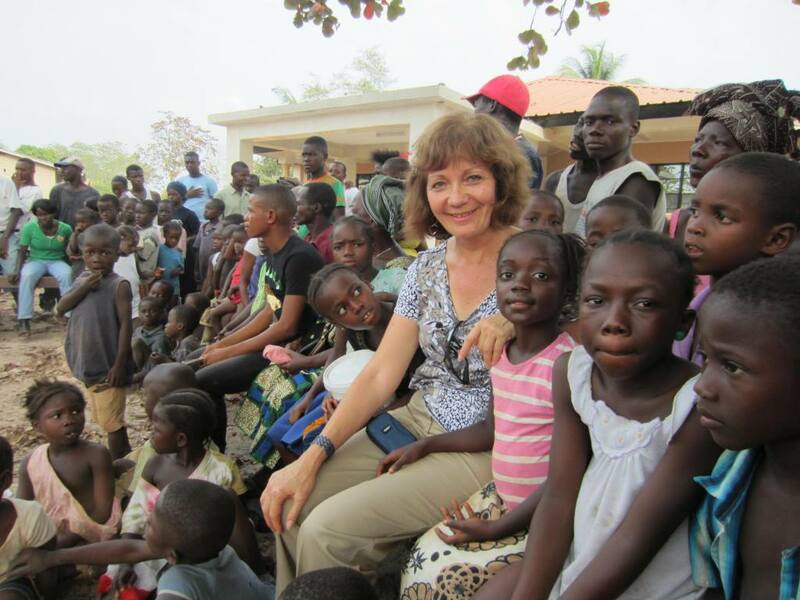 There are plenty of former Volunteers like me, and lots of Sierra Leone and West African expats in these countries. But why would two people hit Like in Turkey? Why 25 views in Greece? Why eleven in Brazil and nine in Venezuela. Why Indonesia, Tunisia, Saudi Arabia, Caymen Islands and Afghanistan? OK, maybe there are Western soldiers of West African descent in Afghanistan. 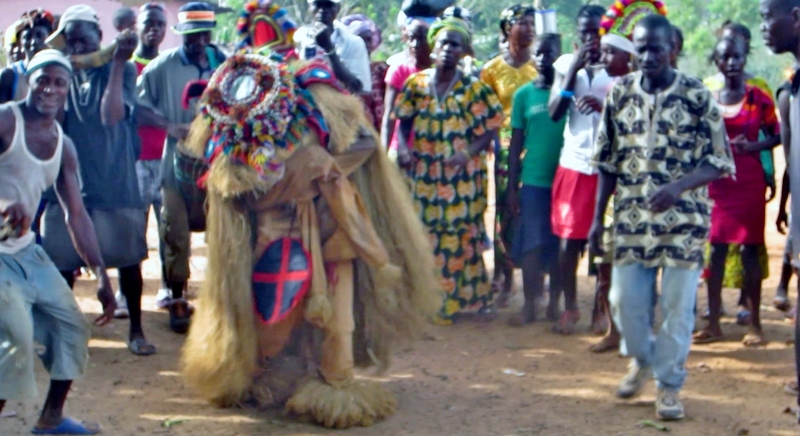 Everyone enjoys Sierra Leone devil dancing. The drumming has an infectious beat. The devils are completely covered to show no sign of the human under a raffia costume disguise that’s flying around with their wild dancing. It’s exotic. It’s colorful. It’s festive. It has a nuance of the unknown and the forbidden for Westerners. Or based on the global YouTube viewers, I should say for non-Africans. What do you do if the devil comes to you? They are leaders in the secret society and command respect and obedience from society members. Some male devils draw fearful respect from women. It’s hard to explain “devils” to Westerners. Devil is no doubt a bad translation to English for what these secret society figures stand for. They’re not evil. Their purpose is not in doing bad things to people, at least not if you stay in line with the norms of behavior for the secret society and community. That’s my best understanding of devils and the secret societies they represent. They’re there to supervise and maintain good behavior and cultural norms in small communities that operated long before the colonial powers brought westernized forms of “law and order.” Even today, there’s very little, if any government presence in villages and small towns. The men’s and women’s societies help keep peace and harmony in their communities, and traditions and customs live on through their schools for young initiates and their ceremonies. No holiday or special event is complete without a show of devil dancing. The event in my video was to celebrate the first sports meet held by Prosperity Girls High School, a big community event in a rural town. Devils are the visible manifestation of the secret society and its leaders. They’re not really unique to West Africa. I remember going to a Founder’s Day kind of parade when I lived in Belgium. The town celebrated their origins going back to the 1200’s with a parade that included ten foot creatures that were men covered in costume on stilts with a huge, somewhat menacing paper mache mask on. They called them puppets. A Belgian friend explained to me the puppets go back to medieval times when townships were first taken over by foreign kings and emperors. The emperor would visit occasionally to reinforce his power over the local people, and parades and ceremonies would ensue. This was the chance for the locals to come out with their huge and slightly menacing “puppets” to symbolically let the emperor know he may have power, but so do they. How did Sierra Leone devils behave when the British colonial governor came to visit? Puppets, devils – whatever you call them, when they come out to parade and dance today, it’s festive and a time to celebrate local culture. I thought you might enjoy seeing this video from the Prosperity Girls first sports meet. There’s a few still slides (no sound) at the beginning showing the Mokebie dance troupe marching into town from their village. Then the video begins with drumming and singing. The big Goboi devil from the men’s society does his dance about a minute in; stick with it as he really gets going as he continues. There’s a woman Sampa dancer at the end. I could imagine her getting a standing ovation if she was on America’s Got Talent. If you can explain why people in 100 countries go to this video on YouTube, please let me know. That part I would like to know.